Alexandrite belongs to Chrysoberyl family which occurs in a range of colors, from green, greenish yellow, and yellow to brown. This very rare and valuable alexandrite changes color from green in daylight to red, mauve, or brown under incandescent light, such as a light bulb. Its composition is Beryllium aluminium oxide. It has got very high projective energy. Another stone comes in this family is Cat’s Eye. 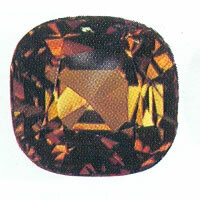 When cut cabochon, this stone shows a white line across the stone, due to canal or feather-like fluid inclusions, or needle-like inclusions called rutile. Alexandrite gives powerful strength and stamina during the period of difficulty and disparity. It helps you to see a situation as a challenge and can aid you in clearing your feelings of weakness or discouragements.